This Mars Exploration Rover Opportunity panoramic camera image shows "Bounce Rock," a rock the airbag-packaged rover struck while rolling to a stop on January 24, 2004. This is the largest rock for as far as the eye can see, approximately 35 centimeters (14 inches) long and 10 centimeters (4 inches) high. There appears to be a dusty coating on the top of parts of the rock, which may have been broken when it was struck by the airbags. 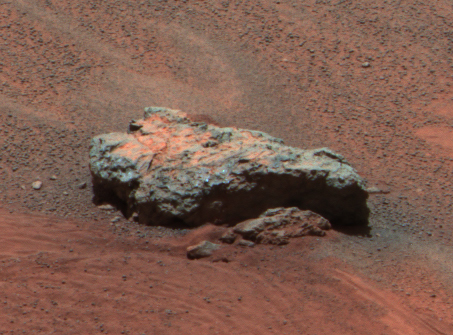 The rock was about 5 meters (16 feet) from the rover when this image was obtained. This is an enhanced color composite image from sol 36 of the rover's journey, generated using the camera's L2 (750 nanometer), L5 (530 nanometer), and L6 (480 nanometer) filters. This rock sort of looks like serpentinized basalt. Any chemical/MI results so far?